If you want a new Mercedes-AMG that’s compact and not astronomically expensive, you could check out the 2019 A35 hatchback. But if you live in the U.S. you’re out of luck. 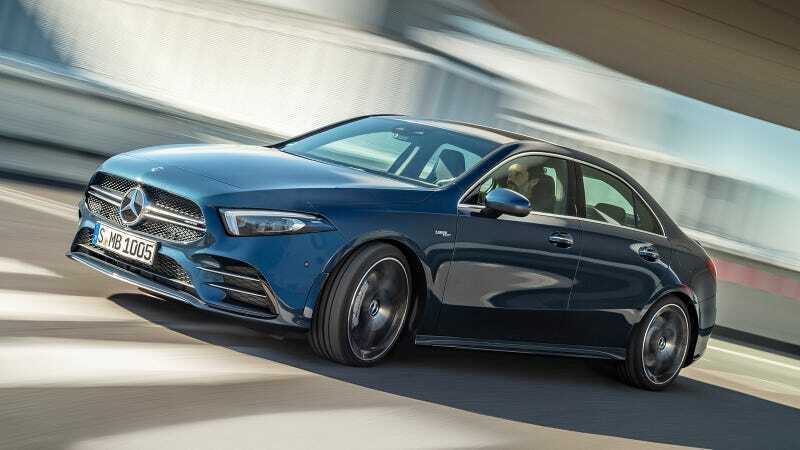 You still are, kind of, but now it appears that the 2020 Mercedes-AMG A35 is making its way to America in the form of a sedan. With the U.S. arrival of the A-Class earlier this year an AMG variant seemed inevitable and indeed, it’s been talked about for some time. But I’m still excited that this particular prophecy has been fulfilled. The 2020 A35 will have a 2.0-liter turbocharged four-cylinder engine rated to 302 horsepower and 295 lb-ft of torque by Mercedes, with a seven-speed automatic transmission and all-wheel drive. That’s a pretty significant bump from the A220, which makes a claimed 188 horsepower and 221 lb-ft of torque with front or all-wheel drive. Mercedes promises a 0 to 60 mph time of a swift 4.7 seconds for the A35, and since the base A-Class is currently the company’s cheapest car, it’s logical to assume the A35 will be the cheapest car you can get new that’s been breathed on by AMG. Excluding whatever diluted “AMG Sport” options you can put on whatever, of course. Official pricing has not been announced, but an A220 lists at $32,500 while a CLA250 lists at $33,100 and a CLA45 starts at $53,100. In Germany, where you can already get an A35 hatchback, the car lists for the equivalent of about $45,000 so that’s probably close to what we’ll have to pay for one here. That money would probably be spent more smartly on an E-Class AMG that’s already done 50,000 miles or so, but we’ll keep that to ourselves since we need people buying new cars so we can pick them up used later, right? That said the A35 really is a sweet looking little package, and of course comes with the benefit of Mercedes’ impressive new human-machine interface. And, yes, I would imagine an even more powerful A45 is in the pipeline eventually, too. I wouldn’t count on the hatchback ever coming to America, though. Mercedes couldn’t have its U.S. customers being mistaken for Mazda people, after all.